A friend gave me the gift of beer: a trial membership in a beer-of-the-month club, The Great American Beer Club, from Clubs of America. Each month I receive a 12 pack of four different types of craft beer, which are delivered to my front door via UPS in special packaging to prevent breakage. Nice! My first shipment in January featured two beers from SweetWater Brewing Company (Atlanta, GA) and two beers from Casco Bay Brewing Company (Portland, ME). My second shipment of brew arrived in March. What’s behind door #2? I couldn’t wait to find out. Beer from South Carolina? 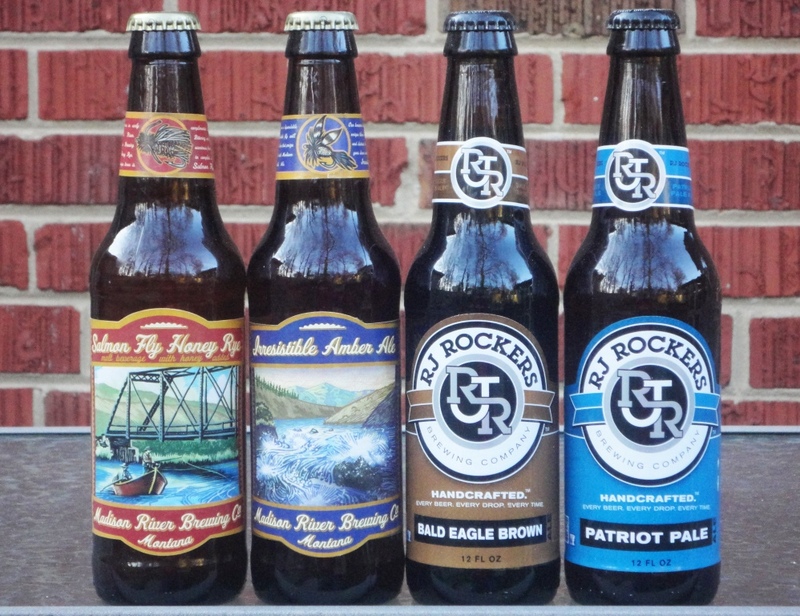 OK, I’d been wanting to try the beer from RJ Rockers (Spartanburg, SC) since I saw it at the beer store but I wasn’t willing to invest in a six pack of beer from a state without a brewing tradition – too many other good brews out there. But I’ll take it as a gift! And beer from Montana? Bonus! Montana brew is rare in these parts, and I became a big fan on my 2011 trip to Yellowstone. During that epic vacation, I had one beer from Madison River Brewing Company (Belgrade, Montana), their Black Ghost Oatmeal Stout. So I was excited to see two different Madison River brews in the shipment. I’m sorry to see my trial membership in the beer club come to an end, but I don’t plan to renew. I love the concept, but not the price: $37 a month for 12 beers. While I wouldn’t buy this for myself, it does make a helluva gift.